I’m not much of a planner and I’m damned sure not a joiner. But this year I’m going to reverse course on both. Call it a New Year’s resolution of sorts. Bit early? Yup. Might as well get a jump on it. 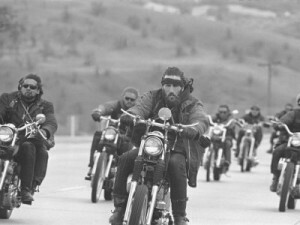 Here’s the scenario: I’ve become a member of a large motorcycle club for owners of a certain German make that counts a bazillion people in it from coast to coast. And I’m going to the club’s national rally this summer in Salem, Oregon. It’s a big deal for me because I’m sort of a loner, seat-of-the-pants guy. Like many free-spirited motorcycle types, I mostly do my own thing. And I like to wing it. I made an exception, though, and so far, I haven’t regretted it. The club’s website is useful for tech tips and I like seeing pictures of other people’s bikes. Included for the $40 annual fee was a phone book with member contact information in case you break down and a subscription to a monthly magazine with tales from other riders. It was as if Bluto Blutarsky had just shouted “roadtrip” into my ear. Of course, I was down. I began thinking of all the fun we would have blasting across state lines into beautiful country, communing with other riders and checking out their bikes along with all the latest gadgets and gear. No kids, no spouses. Lots of beer. Serious fun indeed. Suddenly, I was contemplating things I’d never thought I would. I’m part of a tribe and we’re going to be doing something, together. Wow. That’s a long time from now. I’m psyched at the moment but can I sustain it? I think so. That’s what the club website is for. And the magazines.Glenn and I will have a hundred Facebook chats between now and then. We’re even trying to get others interested in the trip. We’re lobbying a mutual friend to sell his old sail boat, buy a bike and join us. Anyone need a boat? Bright yellow and orange leaves are piling up on the street as I roll my motorcycle out of the garage. It’s November in Northern California and I’m going for a ride. The air is warm. I sweat as I start the bike and head off, a welcome breeze blowing into my textile jacket. My neighborhood seems to shimmer in the autumn light. It’s that time of year when it’s cold enough at night to turn the leaves but so mild by day you forget its only three weeks until Thanksgiving. Back east, they’re dealing with the aftermath of a killer storm and an approaching Nor’easter. Here we’re walking around in rolled up shirtsleeves and big smiles. It’s like we’re getting away with something. We’re not, of course. Everyone seems to know that this fickle weather is connected to something darker and of our own doing– climate change. But we can take some consolation in the lighter environmental footprint of motorcycles. We use less gas and emit fewer toxins so we’re a smarter, saner transportation choice. 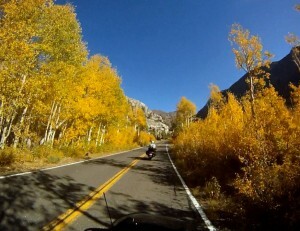 Motorcycles are also a lot more fun for a Saturday morning jaunt to high country to see beautiful fall foliage. I choose the route of California settlers, riding east on Highway 108 over the Sonora Pass. The first golden groves of Aspen meet me at about 6,000 feet and stay with me over the summit, into the Eastern Sierra. I gaze toward Nevada as I descend the back side, awash in the seasonal palate of reds, oranges and yellows. 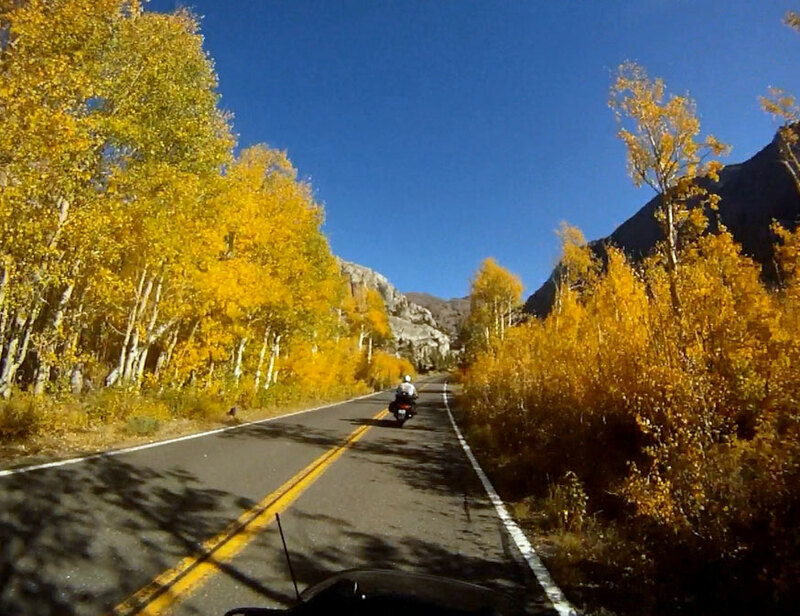 With the sun at my back — and not a car in sight — I crank the throttle until it is all a blur. Granite canyons open to fields of technicolor grasses. Pine trees whizz by like fence posts. And hawks soar over head, just out of reach. As I slow for the stop sign at state Highway 395, I ponder the majesty of it all. I shut off the bike and stare at a distant mountain range. My motor ticks as it cools. Then a northbound 18-wheeler roars by in front of me, pelting me with fine sand. I blink, hit the starter and flip a u-turn.